Vadim Tsibulevsky is one of the very few versatile violinists who can successfully combine solo and chamber music performances with leading major orchestras. 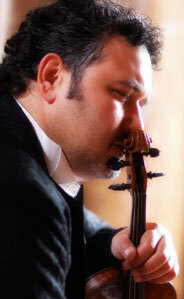 He is performing as a soloist in Europe, Israel and Russia, participating in festivals such as Festival Massenet, Festival Pau Casals and, being 1st Concertmaster of the Netherlands Philharmonic Orchestra, plays as the guest Concertmaster with Flemish Radio Orchestra, Residence Orchestra (Den Haag) and WDR Symphony Orchestra (Cologne) among others. Vadim Tsibulevsky first came to the public attention when at age of ten he won a Republican Contest in Baku, Azerbaijan, and made a highly acclaimed debut with the National Symphony Orchestra of Azerbaijan under Maestro Niazi. Two years later he was awarded the First Prize at a Regional Trans-Caucasian Competition (for age group up to 16) and was invited to study in Moscow with Professor Sergey Kravchenko (assistant of the legendary violinist Leonid Kogan). Vadim became a Concertmaster of the Moscow Conservatory Chamber Orchestra and gave many recitals and concerts all over the USSR. Searching for new perspectives, Vadim immigrated to Israel in 1990. He joined the Israel Chamber Orchestra under direction of Shlomo Mintz, while at the same time continuing his studies as a graduate student in Rubin's Academy of Music in Tel-Aviv under Professor Yair Kless. Shortly afterwards Vadim was chosen for a public masterclass with Yehudi Menuhin, whose magical "blessing" will remain with him forever. One year later Vadim won the Israeli Competition for New Immigrant Musicians, and upon recommendation of Shlomo Mintz he received a fabulous Rugeri violin from the American-Israel Cultural Foundation. In 1996 Vadim accepted the position of Concertmaster in the "I Fiamminghi" Chamber Orchestra of Belgium, which gave him the opportunity to launch a European career. Since then he resides in Belgium with his wife and 3 daughters. His latest recording in collaboration with French conductor Grigory Penteleitchouk features Chausson's "Poeme" and Paganini's Variations for violin solo "Nel Cor Piu Non Mi Sento".